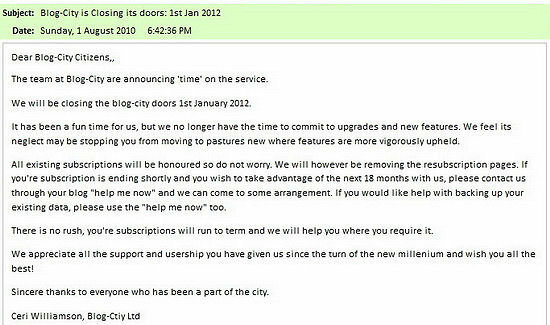 Received a notification from Blog-City informing me that they are going to close down at the end of 2011. I have 6-1/2 years' worth of blog. Walau..... how to migrate!!!???? There are not a mainstream blog provider and so migration isn't as straight-forward as the mainstreamed ones have tools to accept each other's format. Blog-City currently exports in either html or rss formats which neither Wordpress nor Blogger/Blogspot recognises. Even somehow I am able to figure a way to migrate the data over, what about the links? They won't auto-correct themselves? URRGGHH!! Any gurus out there can help!! Please? p.s. I am inclined to take on Wordpress and register a domain to it. Afternote (18 Aug 2010): At the end of the day, you are reading this here at JayWalk Online (Blogger platform). I laughed when I read you scold Hong Kan! So classic. Aiya, bo lah... I am thinking to help you to do the editing too. But wait for Guru to comment first. Try Bluehost for wordpress. I been thinking of migrating but then it still add some cost to me. ruok: Will not be hosting on any server. Will sign up for an account on wordpress and then buy a domain to point to that url. sunflower: kachow you only lah.